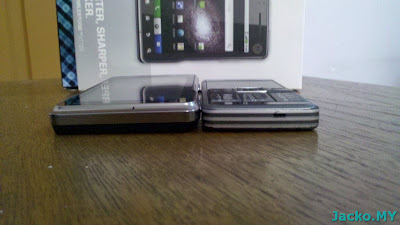 Size is also one of the criteria that I consider when deciding a phone. However, there is not many options if you're into smart phone. It's more or less identical in 2 dimensions, the height and the depth (thickness) but XT720 is wider to house a 3.7" screen. 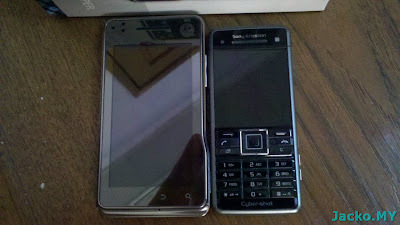 It's almost identical with XT800 in all 3 dimensions, with XT800 slightly higher and wider with it curvy form factor. 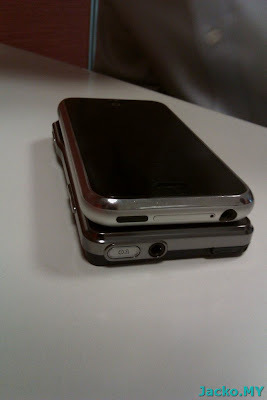 iPhone 2G is thicker. 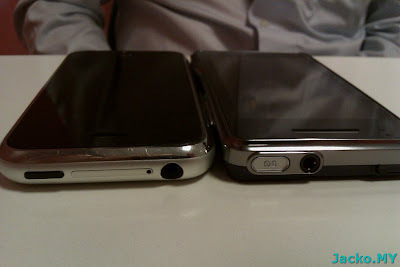 I forgot to take photo with the 4G, both are almost identical though. Many ask me the impression on Android. It's a good open platform that can really challenge the dominance of iPhone and Windows Mobile (used to be). However, without a driver to lead the direction, the roadmap of where Android wants to position itself is unclear. To position itself as an entertainment / multimedia platform like iPhone? IMHO, it still tails Apple very much behind, though Android Market has marked 100,000 applications but how many of them are really the quality applications and compatible with various devices not only a single model? One may conduct a survey to see how many would buy Galaxy Tab over iPad, at least I got 100% vote on the latter within my social ring. "Tab is nice but is not as impressive as iPad", that's the response from them. As a productivity tool like Windows Mobile used to be? Without the integration with Outlook, how do majority of the users (with Outlook) to sync or port over their data to the Android platform? Google might be attempting to promote cloud computing to keep user data such as contacts in the cloud, I reckon it wouldn't be a success without a proper transition tool and window for users to adapt to. With Windows Phone 7 coming strong after the debut launch a month ago and so far clowned with all positive reviews and promising applications, I guess quite a number of Android users (if you google Outlook sync and read out the forums) might jump ship if they found WP7 could deliver what they want. Nevertheless, I still hold on to this XT720 Android phone regardless of missing pieces that I used to have with my WinMo and even the typical mobile phone platform c902. I almost grabbed myself a Steve Job's baby, iPhone 4 (remember I like squarish design?) but pulled hand break after the Antenna Gate. 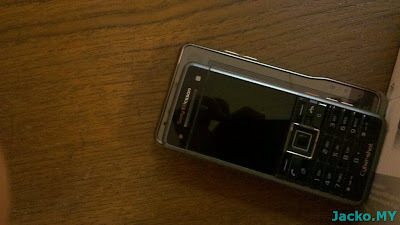 Now I am looking forward for WP7, hopefully I could experience one in my upcoming trip to HK. By the way, you may try this if you want to sync your text-only contacts from Outlook to Google or this if you have photo in the contacts. There are few more like SyncMyCall and OGG Sync which may do better job with a little premium to pay.